Crystal Shrimp Dumplings are a famous traditional snack in Guangdong Province and belong to the Cantonese cuisine. Shrimp means “Xia”, dumplings mean “Jiao”, So Shrimp Dumplings mean “Xia Jiao” in Chinese. Xia Jiao means “har gow” in Cantonese. Shrimp dumplings were first made in a pastry shop in Wu Village, Guangzhou, in the early 20th century, over 100 years ago. At that time, Wu Village was very beautiful and prosperous. On both sides of the river, fishing boats would often be selling their fish and shrimp. In order to attract customers, the owner of this particular restaurant purchased locally acquired shrimp as well as pork and bamboo shoots to use as fillings to make shrimp dumplings. 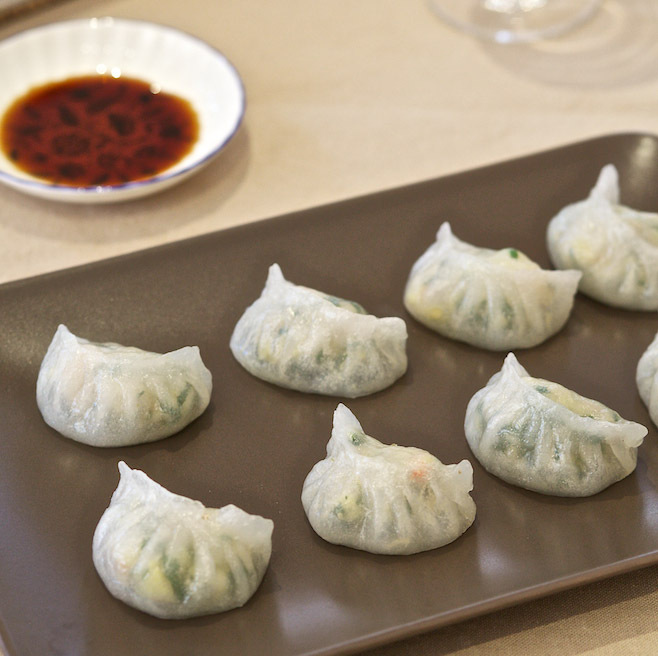 At that time, shrimp dumplings were not very well known, but because of their originality and delicious taste, they quickly won the favor of diners. They became famous in Guangzhou and influenced the Cantonese-style dim sum. The major restaurants competed with each other making and selling these delicious dumplings, and guests were attracted by the skill of the best pastry chefs as much as the delicious taste of these dumplings. Remember to order a load of shrimp dumplings every time you go to a snack shop in Guangzhou. You will find it hard to resist the temptation to eat more, so make sure you get plenty. But today, I’m going to teach you to make them so you can get them any time you want. The thing about shrimp dumplings that people notice is the crystal clear skin. Many people have attempted this and failed. After trying several times, the work pays off, and you will begin to progress. The skin of the shrimp dumplings is made not only highly transparent, but also has a particularly elastic feel when you’re eating it, which complements the tender shrimps in the filling perfectly. The main ingredients of the Crystal Shrimp Dumpling skins are wheat starch (cornflour) and tapioca starch. Wheat starch is extracted from wheat flour, which contains some gluten (less than 1%). This gluten provides the necessary strength and elasticity for shrimp dumpling skin. The ratio of amylopectin to amylose in tapioca starch is as high as 80:20, making it thick, as well as sticky. After cooking, the tapioca starch is transparent and colorless, and because it is tasteless, it is naturally a good partner for wheat starch. 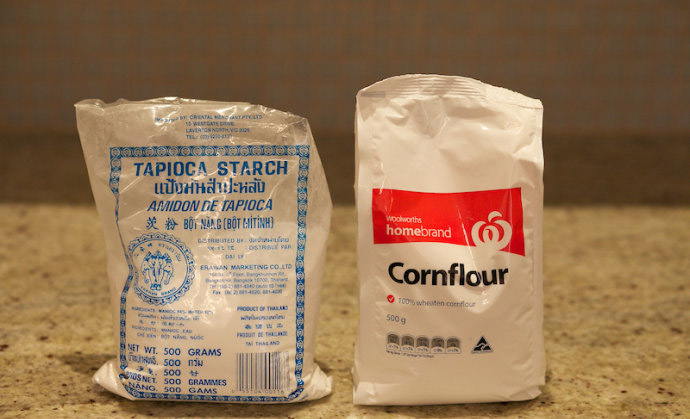 There are many different claims about what the ratio of wheat starch to tapioca starch should be. After several attempts, I found that a 1:1 ratio is a good formula. Unlike ordinary dumplings, Crystal Shrimp Dumplings must be made using boiling water. 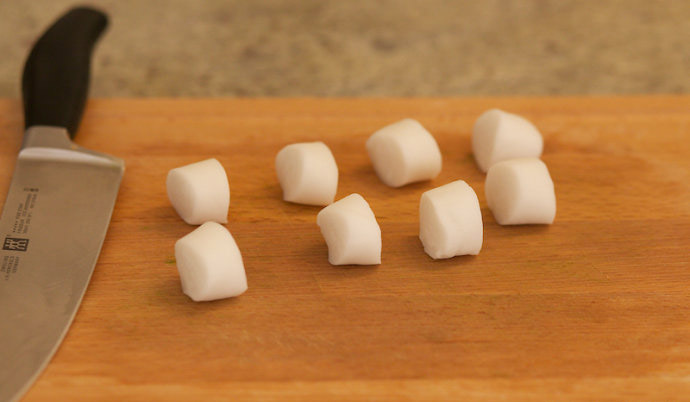 Starch is gelatinized at high temperatures and turns from an opaque white powder to a translucent dough. As for the proportions of starch and water, a ratio of 1:1 is used here, but you may find some tweaking is needed to achieve the best effect. This recipe has two parts. 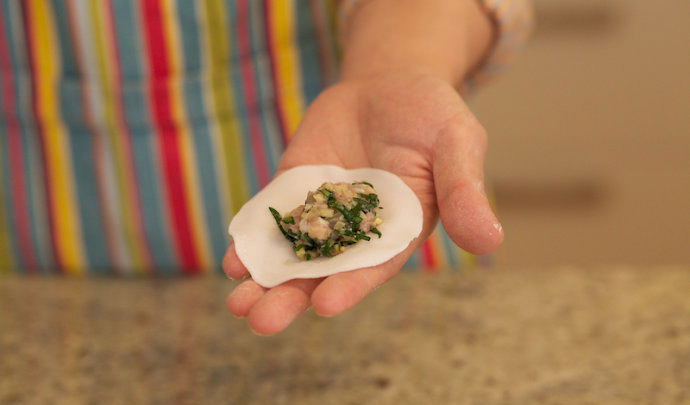 The first part, shows how to make the skin of the Crystal Shrimp Dumplings and the second part tells how to make the filling for these dumplings. Boil the water. I recommend using an electric kettle rather than boiling the water on the stove, as it will save you a lot of time. Do not measure 300 ml of water and then boil it as the moisture will evaporate and the amount of water will be reduced. Fill the kettle and boil it. 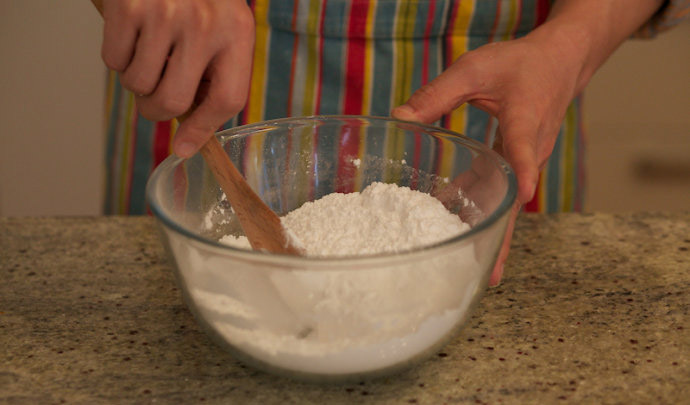 Place the bowl with the starch mix onto a scale and set it to zero. Pour boiling water into the mixture until it weighs 300 grams. 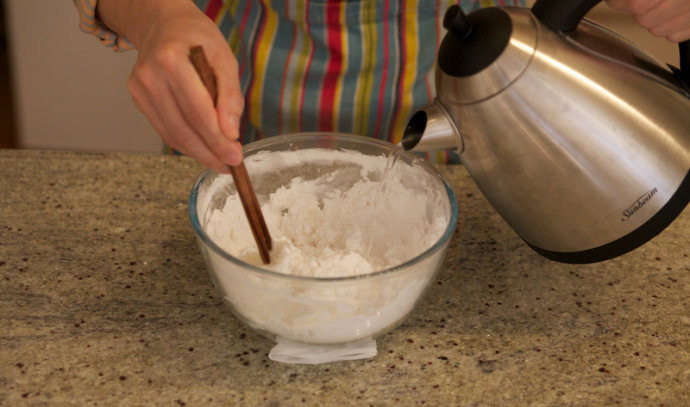 Make the shrimp dumpling skin: place the wheat starch and tapioca starch into a large bowl and stir with a wooden spoon. Mix well. Next, with the bowl on the scales set to zero, pour the boiling water from the kettle slowly into the starch mixture while quickly stirring with chopsticks until it weighs 300 grams. After the boiling water is added, continue stirring the mixture for a while. At this point, the mixture should already be turning into a translucent paste in the bowl. 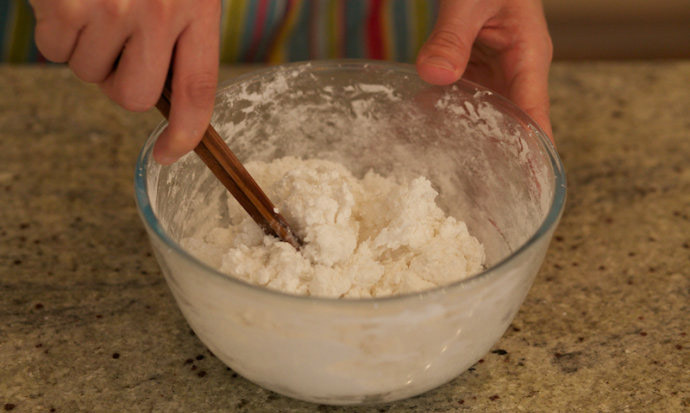 Transfer the starch mixture to the surface you want to make the dough on, such as your countertop. You will be using your hands to form the dough, and even though it may still be quite hot, there is no better way to do it. If we love to eat, we cannot be afraid of suffering. As the dough is forming, you will notice that the dough is starting to turn a very elastic texture and feels like a water-filled balloon. 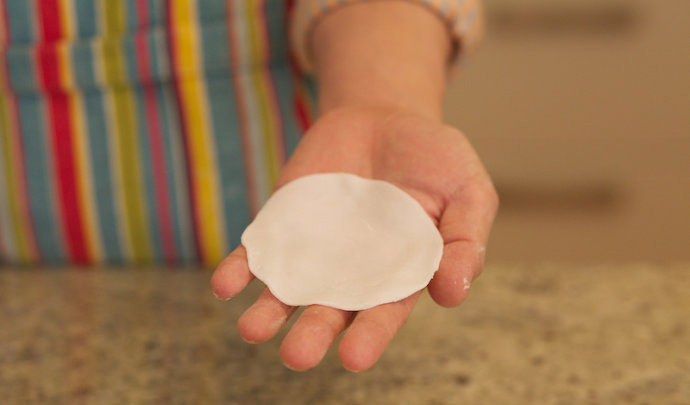 The dough of a good shrimp dumpling skin should look like the picture below. The surface should be smooth and elastic. 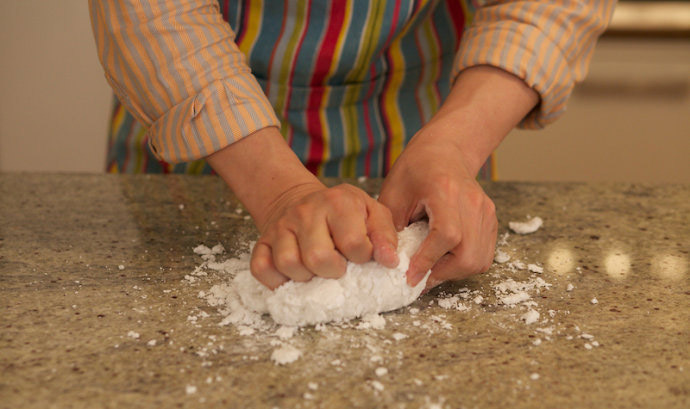 Fresh dough cannot be used straight away because the elasticity is high, almost like rubber, and makes it difficult to roll into a shrimp dumpling skin. You need to let it relax, preferably in a sealed box, while you prepare the shrimp dumpling filling. There is actually no special way to make the shrimp dumpling filling work. Some people use shrimp paste to help stick the filling together, while others use whole shrimps to add more taste. The taste and appearance of whole shrimp are appealing but is not practical when making the dumplings. So here we use a good method that requires you to cut the whole shrimp into 4-5 portions, which not only preserves the unique elasticity of the shrimp itself, but also makes the assembling of the dumplings less difficult. 250g shrimp (Choose the best quality shrimp you can buy. High-quality live shrimp is usually best, but you can also use high-quality frozen shrimp. We are using frozen shrimp in this recipe. High-quality frozen shrimps are frozen immediately on the boats, in order to preserve the freshness of the shrimp meat). 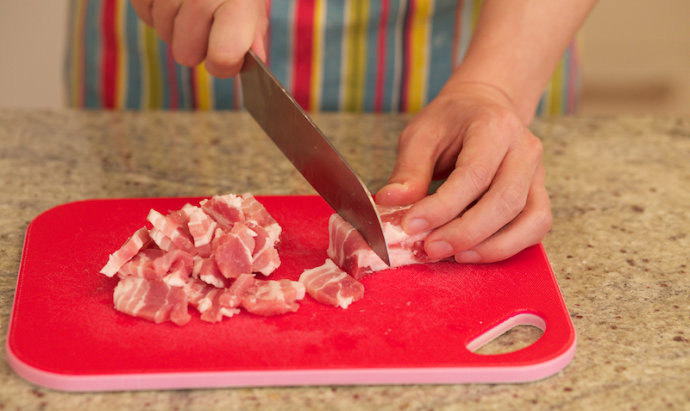 The first step is to remove the skin from the pork belly and slice it into small, semi-thick pieces. 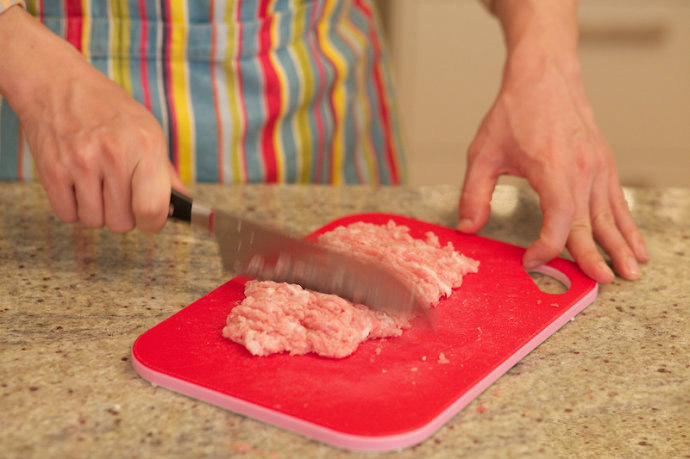 Use a knife to slice all the meat up so it turns into mince. This can be tedious work, but meat that is minced by hand has better elasticity that prepackaged mince, and can be combined better with shrimp meat. If you find this is too hard, you can buy 250g of low fat pork mince from the store. 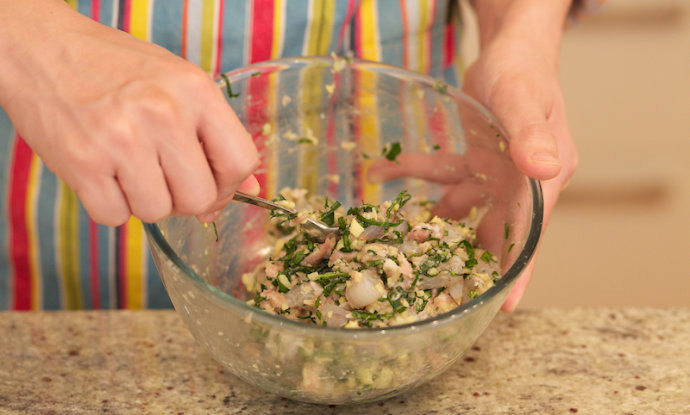 The second step is to cut the shrimp into small pieces of about one centimeter. Next, chop the bamboo shoots into tiny pieces. The smaller the better. 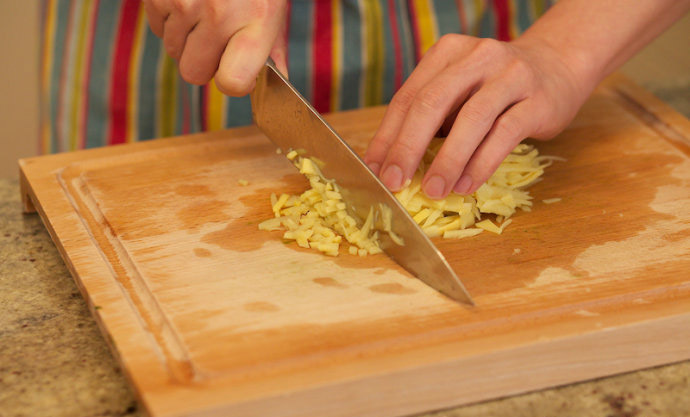 If you use canned bamboo shoots, which contain more water, you can squeeze the water into the filling with your hands. The meat can easily absorb this liquid. Combine the pork, shrimp, bamboo shoots, kale leaves, sesame oil, salt, and pepper together and stir well with a stainless-steel spoon. You will need to put the amount of pepper you want in, depending on how much you like. Also make sure you put a moderate amount of salt and sesame oil in. Now, it is time to do the last step: assembling the dumplings. There is as much expectation on how a dumpling looks as how to how it tastes. For example, there must be a round bulging part below the top of the dumpling, with 10-12 pleats. If there are not enough pleats, it means that the master chef’s skill is poor. Don’t expect to get this exactly right straightaway, it will take a few attempts to get it down pat. 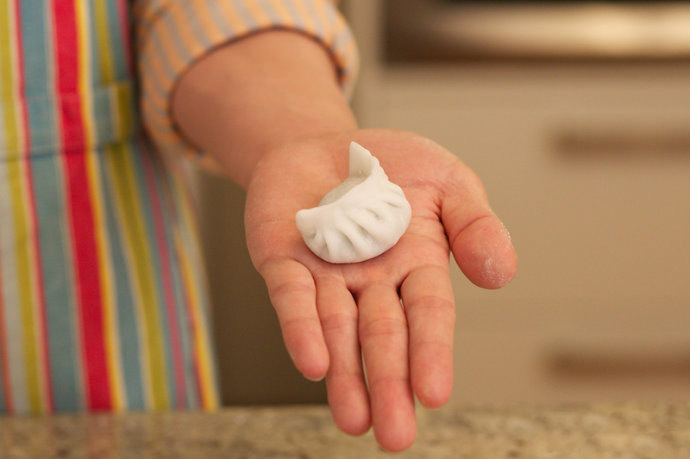 The first step before assembling the dumplings is to get your steamer ready. Fill it with sufficient water and bring it to the boil on high. While you are waiting for the water to boil, assemble the dumplings. 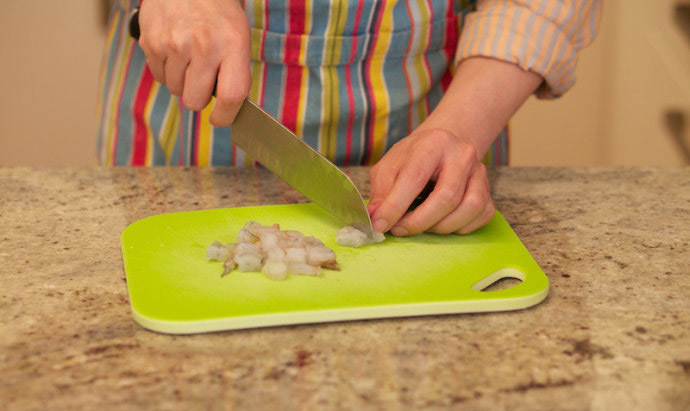 First, cut a portion out of the dough with a knife roll it with your hands into a strip of about 2.5 cm wide. Cut this into about 8 equal portions. Using a rolling pin, roll out each portion in a circle with an 8-10 cm circumference. The chef who specializes in making shrimp dumplings uses a round-shaped cutter to make the circles. This is a fast and good method. If you do not have a cutter, you can use a rolling pin. 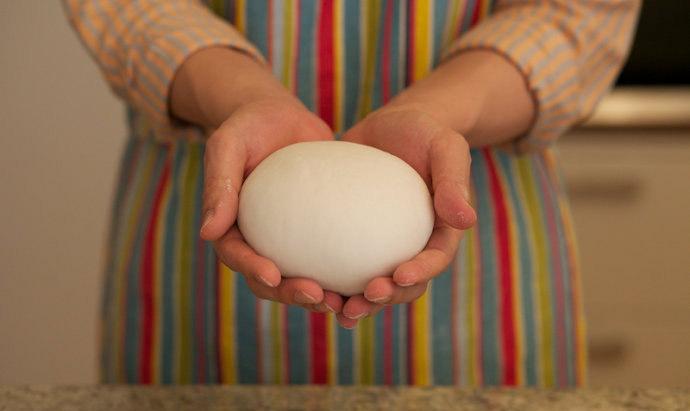 It takes a lot of effort and patience to pick it up, because the elasticity of the dough is really strong. Starting from the edge near the filling, crimp the edges ¾ of the way around the dumpling, leaving ¼ uncrimped. Then press the remaining part against the pleated section and pinch the edges together firmly, to ensure that the two do not separate. 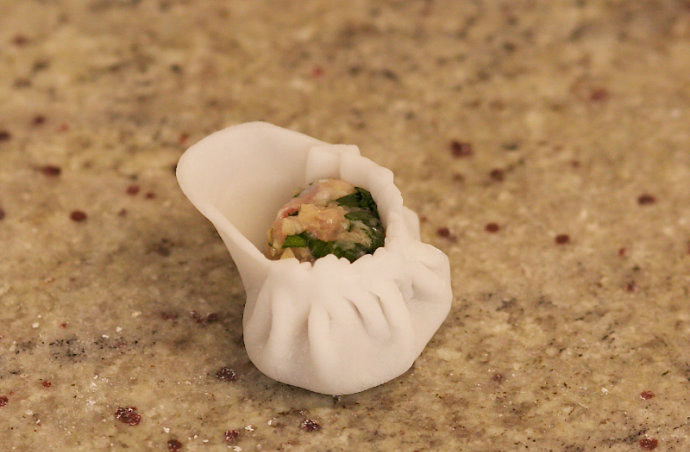 This completes our first shrimp dumpling! The last and simplest step is to steam the shrimp dumplings. Place some nonstick baking paper inside the steamer. When the water in the steamer begins to boil, place the shrimp dumplings into the steamer. Make sure there is enough space between the dumplings, otherwise if they stick, it is not easy to pull them apart and their appearance is ruined. After they are covered with the lid, you can start the timer. After 6 minutes of steaming, you can turn off the heat and remove the pan. When you open the lid, you may be a bit shocked. The dumplings will not look very transparent. Don’t think you have done something wrong or that our method doesn’t work. When the steam is gone, the magic begins and you will see that the shrimp dumpling skin slowly becomes transparent and you will be able to see the filling inside. 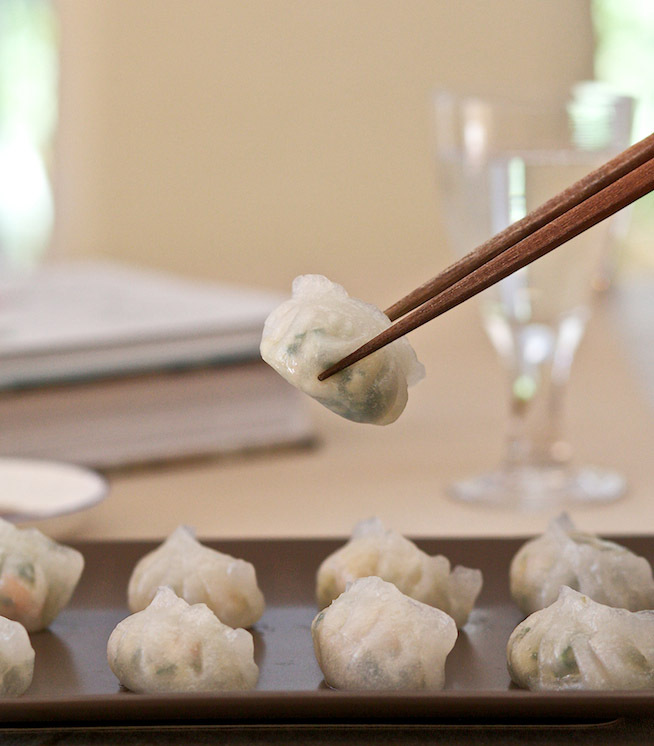 1.Shrimp dumplings must be made using boiling water, and the ratio of water to starch should be measured exactly right. 2.Fresh, high quality shrimp gives the best results. 3.The steaming process should not exceed 6 minutes or they will break open.